Town and Country Planning Barpeta Recruitment 2017 notification about for filling up following Junior Assistant jobs under Town & Country Planning Barpeta, Assam. Qualification: Candidates should be Graduate from any recognized university and the candidates must possess a minimum 6 months Diploma/ Certificate in Computer from Govt. recognized Institute. Pay Scale: PB-2, Rs.14000/- to Rs.49000/- + GP of Rs.5600/- PM. The candidates whose applications are accepted will be required to appear in a Written Test and those candidates who qualify for the written test will be called for computer test and viva voce. Application Fee: A Treasury Challan of Rs.150/- for SC/ST/OBC/MOBC should be deposited in the Head of Account ''0070-Other Administrative Services-60-Other Services-800-Other Receipts.'' candidates having BPL Certificate & Person with disability candidate = Nil. Interested and eligible candidates may apply in the prescribed standard form of application along with Self-attested Copies of all Certificate/Mark Sheet regarding Educational and other qualification, Age, Caste, BPL, Employment Exchange Registration Card and Original Treasury Challan Copy should be reached the following given address within time. ''To, the O/o the Deputy Director, Town & Country Planning, District Office, Barpeta''. The standard form of application. 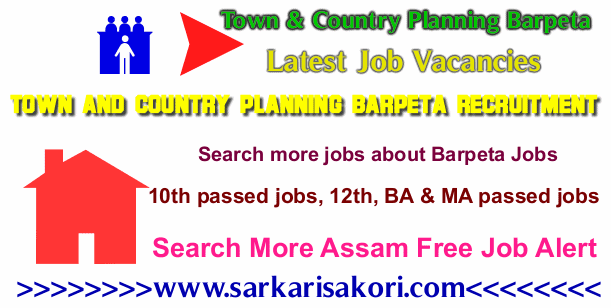 You will be interested more jobs about Town and Country Planning Barpeta Recruitment & Latest Assam Govt Jobs Alert 2017.